The Gateway City of St. Louis is the epitome of the modern Midwestern metropolis. Missouri's second-largest city is vibrant but laid-back, populous but navigable, historic but still relevant. The city's planners have created an aesthetically beautiful city, with plenty of green space amidst buildings both old and new, framed by the majestic Mississippi and Missouri rivers. And capping it all is the world's tallest man-made monument, the beautiful and iconic Gateway Arch. St. Louis is a city of culture and surprisingly inexpensive. Among American cities, only Washington, D.C. has more free attractions for tourists and residents alike. Hotels, restaurants, and even parking garages avoid the premium pricing common in other big cities. Although often overlooked, St. Louis can be an affordable, educational, and fun family getaway. The city is named after King Louis IX of France, but is pronounced "Saint Lewis", not "Saint Louie". 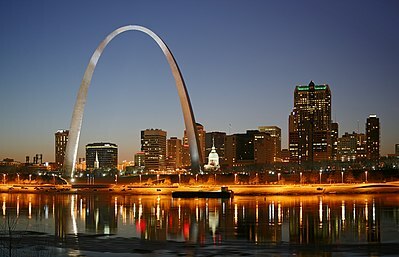 St. Louis is known by the nickname of The Gateway to the West. The city was the last major stop before pioneers journeyed westward to the Pacific coast. The city also played a large part during the steamboat era due to its position at the confluence of the Mississippi River and the Missouri River. St. Louis was acquired from France by the United States during President Thomas Jefferson's term in 1803 as part of the Louisiana Purchase. The transfer of power from Spain was made official in a ceremony called "Three Flags Day." On March 8, 1804, the Spanish flag was lowered and the French one raised. On March 10, the French flag was replaced by that of the USA. In 1904, St. Louis hosted that year's World's Fair and the Summer Olympic Games. Many of the parks, buildings, and finer homes in St. Louis were built around this time period. While the Fair has passed out of living memory, it holds an important place in the modern development of the city. Before Detroit became America's automotive capital, St. Louis was the largest producer of American automobiles in the early part of the 20th century. Midtown and Downtown still have many of the original warehouses and factories standing, but most have been converted to other purposes, such as loft apartments, shops and restaurants. St. Louis was also home to a bustling fashion manufacturing industry in the early 1900s, centered on Washington Avenue downtown. As with the auto industry, the last remnants of the fashion manufacturing industry can be found in the rehabilitated warehouses which contain new businesses and loft condominiums. In the late 20th century, St. Louis began a transformation from a manufacturing and industrial economy into a globally known center for research in medicine, biotechnology, and other sciences. Firms such as Monsanto, Centene, Solae, Energizer, Enterprise Rent-A-Car, Edward Jones, Wells Fargo Advisors (formerly A.G. Edwards), Anheuser-Busch/Inbev are headquartered in St. Louis. AT&T and Bank of America operate major regional offices here. Two major private research universities, Washington University in St. Louis and Saint Louis University, are an important part of the local economy and society. Source: Wikipedia. Visit The Weather Channel for a ten-day forecast. Interstate 70 connects to Kansas City to the west, and Indianapolis and Columbus to the east. Interstate 64 connects to Louisville to the east. Interstate 55 connects to Chicago to the north and Memphis to the south. Interstate 44 connects to Springfield (Missouri), Tulsa, and Oklahoma City to the southwest. Within the St. Louis area, Interstate 270 (Interstate 255 on the Illinois side) forms a loop around the metropolitan area, bypassing the center city. Locals may refer to Interstate 64 as "Highway 40" - US-40 is coincident with I-64 through St. Louis. Also, older or more traditional residents are likely to pronounce 40 as "Farty", which out-of-towners sometimes find humorous. Amtrak (+1 800 USA-RAIL, 551 S 16th St) offers five daily arrivals from Chicago, two daily arrivals from Kansas City, and one daily arrival from Los Angeles, San Antonio via Dallas, Little Rock and many smaller intermediate stops on each route. 38.624186-90.2035424 Gateway Multimodal Transportation Center, 430 S 15th St, is the central train and bus terminal in St. Louis. It is directly linked to the Civic Center station on the MetroLink light rail system. If you have time to spare when departing or arriving by train, take a seat at the Grand Hall at the nearby historic Union Station, now turned into a hotel and shopping arcade, to relive past glory of rail travel. St. Louis Union Station was also the site where President elect Truman was photographed holding the Chicago Daily Tribune with the erroneous headline "Dewey Defeats Truman". The bus terminal, which is served by Greyhound and Megabus, is at 430 S 15th St, next to the train station. MetroLink, +1 314 231-2345 - A light rail system that runs to many of the metropolitan area's most popular destinations. There are two branches on the Missouri site of the river - the Red Line begins at Lambert-St. Louis International Airport, while the Blue Line begins in the suburb of Shrewsbury. The lines merge at the edge of Forest Park, and travel through downtown and into Illinois. MetroLink stops at the Delmar Loop, Grand Center arts district, Forest Park, the Central West End, Downtown St. Louis, and Downtown Clayton, among other places. The campuses of University of Missouri-St. Louis, Washington University and St. Louis University each have stops on campus or nearby. A 2-hour transfer pass costs $3 ($4 if purchased at the airport station). Metro St. Louis operates buses around the St. Louis metro area, although in many cases, they don't run as frequently as you would like. A single fare is $2. Taxis generally do not drive around looking for street hails; you must order service by phone or from an app. Uber is extremely popular and useful in St. Louis. A 2015 accident in a taxi that did not have insurance has caused a controversy - make sure you choose a reputable taxi or ride-hailing company. St. Louis City is separate from St. Louis County - the city is really a city without a county, with its own government, school system, and other services. St. Louis City has just under 400,000 residents while St. Louis County has just over 1,000,000 residents. The entire St. Louis metropolitan region has approximately 3,000,000 residents. Downtown - The Central Business District of St. Louis, downtown is nearing the end of a decade-long multi-billion dollar revitalization. Featuring professional sports stadiums, dozens of hotels, corporate headquarters, trendy dining and shopping, entertainment, nightlife, and the Gateway Arch, downtown St. Louis is now also home to tens of thousands of residents, many living in warehouses that have been converted to apartments and condominiums. Laclede's Landing - Next to the Mississippi River, north of the Arch, this is one of the oldest standing neighborhoods of the city. A former industrial area, the Landing has original cobblestone streets, horse-drawn carriage rides in the evenings, live music, and restaurants and bars in converted industrial buildings. Soulard - To the southwest of downtown lies St. Louis's oldest neighborhood. Today it is a perfect case study for traditional St. Louis red brick architecture, and also features the famous Soulard Farmers Market and many trendy restaurants. Old North St Louis - Just north of Downtown, the historic Old North neighborhood is in the midst of a dramatic revitalization that includes a significant number of historically rehabilitated brick, 19th Century structures; new businesses, such as Old North Grocery Co-op, Therapy Boutique, and La Mancha Coffeehouse; and a diverse community of residents, with a population that grew by 28% since 2000. The center of the neighborhood is at St. Louis Avenue & N. 14th Street, which is where the legendary Crown Candy Kitchen is found, along with the Crown Square, the $35 million redevelopment of the former 14th Street Pedestrian Mall. Crown Square is also the site of the North City Farmers' Market, which in 2010 was identified as one of "America's Favorite Farmers' Markets," according to American Farmland Trust. Benton Park/Brewery - Just south of Soulard, Benton Park has come back from decades of disrepair. The area contains the Anheuser Busch Brewery and the old Lemp Brewery, in addition to a small eponymous park and working-class versions of the townhomes of Lafayette Square. Forest Park Southeast - Forest Park Southeast is at the beginning of a revitalization. Younger professionals have been attracted to the area due to the popular bars, and have since settled down and contributed to the area's infrastructure. Grand Center/Midtown - West of Downtown down an area known as the Central Corridor (that includes Forest Park and the CWE), Grand Center is home to a booming performing arts, theatre, and museum district. St. Louis University is in this area. Central West End - A very cosmopolitan neighborhood featuring stunning turn-of-the-century palace-like homes, upscale dining, and boutique shopping, the Central West End also contains an eclectic mix of antique shops, coffee houses, and art galleries. It's on the eastern edge of Forest Park, and includes the world-renowned Medical School of Washington University. North St. Louis - The historic African-American neighborhood known as "The Ville", and contains many historical sites relating to the history of Black Americans in the Midwest, including Sumner High School and Homer G. Phillips Hospital. This area extends north from Delmar Boulevard, and contains much of the industrial record of St. Louis and the migration of newcomers to the city. Cherokee Street - A long-time shopping district, created from the convergence of two streetcar lines, this 12 block stretch of antique stores, cafés, restaurants and bars is divided by Jefferson Avenue. Cherokee Street runs from the antique and vintage stores, starting at what remains of the old Lemp Brewery warehouses, east of Jefferson. It crosses over to host 5 blocks of hipster/grunge bars, capped by the city’s most celebrated collection of Hispanic bakeries & taquerias. All of it centered on the Cinco de Mayo festival, each weekend around May 5th. It's also the city center for burlesque, with the Casa Loma Ballroom hosting the annual Show-me Burlesque Festival each June. This neighborhood is having a resurgence, becoming a destination for shopping, dining and entertainment, south of Benton Park/Brewery. The Gateway Arch's shape is what's known as a catenary arch. It looks similar to a parabola, but you might know it as the shape created when a chain or string is suspended from two points. (That makes the Gateway Arch an inverted catenary, of course.) In particular, it's a specific catenary arch with a width exactly equal to its height (both 630 feet [192 m]). Cross sections of the Arch are triangular, a trait readily visible from within the tram pods during the trip to the top. The arch is constructed of carbon steel, clad with stainless steel, on a concrete and carbon steel core. Its foundation is anchored 60 feet (18 m) underground. 38.5975-90.2122221 Anheuser-Busch Brewery, 1200 Lynch St, ☎ +1 314 577-2626. The place where all Anheuser-Busch beers are made for the mid-west U.S. Free tour, with free beer samples for those 21+, of one of the world's largest breweries and bottling factories, housed in beautiful red-brick buildings. The Clydesdale horses and their historic truck and stables are one of the biggest attractions on the tour, as are the brew house and packaging facility. The adjacent beer garden serves really good food and offers cheap samples of most Anheuser-Busch branded beer, from Goose Island to Hoegaarden. 38.6425-90.25462 Cathedral Basilica of St. Louis, 4431 Lindell Blvd (at Newstead Ave in the Central West End neighborhood), ☎ +1 314 373-8200. 7AM-7PM. This Roman Catholic church contains the most mosaic art in one site in the world—83,000 square feet, installed by a family of artists who used more than 41 million tiles with more than 7,000 colors. 38.628056-90.1713896 Eads Bridge. This bridge was the first to cross the Mississippi at St. Louis, the first primarily steel structure in the world, and the longest bridge in the world at completion in 1874. This overlooked landmark is worth checking out for the Eiffel Tower-like steel lattice that still holds up cars and the MetroLink to this day. It connects to Washington Avenue, and is directly adjacent to Laclede's Landing, both are centers of St. Louis nightlife. The easiest way to access Eads Bridge is via the Laclede's Landing MetroLink stop. Well worth a walk across as one of the best places to see the sun setting with the Gateway Arch and city providing a very artistic view of the area. 38.638889-90.2847227 Forest Park. One of the nation's largest city parks, with 1,293 acres, is open to the public for golf, tennis, baseball, bicycling, boating, fishing, handball, ice skating, in-line skating, jogging, cricket, rugby and more. The park is also home to the St. Louis Science Center, the art museum, the zoo, and a history museum, all with free admission. Forest Park is really at the heart of St. Louis. It was also the site of the 1904 Louisiana Purchase World's Fair, which lays claim to serving the first hot dogs, hamburgers, and ice cream cones. You cannot visit St. Louis without hearing about, driving by, or exploring Forest Park. 38.6258-90.189314 Old Courthouse. The site of the historic Dred Scott slavery case which was one of the seeds of the Civil War. While the Park is under construction, you can buy tickets to the arch here. The Courthouse also holds exhibits from the now-closed Museum of Westward Expansion, which used to be underneath the Arch. Free. 38.6241-90.187215 Old Cathedral (Basilica of Saint Louis, King of France), 209 Walnut St, ☎ +1 314 231-3250. The first cathedral built west of the Mississippi River (1834), this is the only building that was spared when the park was constructed. It's still an active Roman Catholic basilica. 38.626944-90.19222219 Wainwright Building, 705 Chestnut St. Designed by Louis Sullivan and built in 1890, it is one of the world's first skyscrapers. Its current occupant is the Missouri Secretary of State. 38.628028-90.20787220 St. Louis Union Station, 1820 Market St, ☎ +1 314 421-6655. This 110-year-old National Historic Landmark has been restored and redeveloped as a dynamic mixed-use project that includes shopping, dining and entertainment. For history buffs, this is where the classic photo of Harry Truman holding the incorrect "DEWEY DEFEATS TRUMAN" newspaper was taken. 38.62811-90.2747321 HealthWorks Kids' Museum, 1100 Macklind Ave, ☎ +1 314 241-7391. Tue-Sat 9:30-4:30, Sun 12-4. An absolutely unique museum designed to teach kids proper tooth-care habits, though adults may find it amusing too. There is a complete set of three-foot tall fiberglass teeth which light up when the hostess brushes them with a six-foot-long toothbrush. A spirited presentation and a short video get kids excited about the subject. The theatre is much-visited by local elementary schools, and you can arrange to tag along with a group or schedule your own trip. This expanded museum replaces the previous Delta Dental Health Theatre Museum. Martin Luther King Bridge; informally the "MLK Bridge"
Stan Musial Veterans Memorial Bridge; informally the "Stan Span"
Clark Bridge; sometimes called the "Super Bridge"
A complete gallery of the Mississippi Bridges can be found here. 38.5278-90.36561 America's Incredible Pizza Company. 38.6322-90.19082 America's Convention Center. Over 500,000 square feet of exhibit space, also featuring formal reception rooms, presentation-style rooms, a theatre, and the Edward Jones Dome next door. 38.6403-90.262134 The Central West End. An eclectic, cosmopolitan neighborhood home to soaring turn-of-the-century mansions on St. Louis's famous private streets, chic dining, and upscale boutique shopping with a great mix of cafés, independent bookstores (check out Left Bank Books on Euclid and McPherson), art galleries, salons, antique and modern furniture such as a Design Within Reach and Centro, coffee houses, and youthful energy. One of the more lively neighborhoods in St. Louis that borders Forest Park, the CWE is a great destination for a day of walking around or a weekend stay. 38.63037-90.184215 Laclede's Landing. Just north of the Arch and part of Downtown St Louis, and the second oldest neighborhood after Soulard, "the Landing" is what amounts to St. Louis' old town. You are likely to enjoy the cobblestone streets and the shops, restaurants, bars, nightclubs, and a bizarre wax museum. Next to the Landing is a $400 million casino complex called Lumiere Place, featuring a Four Seasons hotel, nightclubs, 75,000 square feet of casino gaming, and an innovative multi-colored light feature spanning 24 vertical floors on the exterior of the building that lights up St. Louis' skyline. Not many original buildings on the Landing remain, as the area is constantly undergoing new developments and rehabilatation of older buildings. Nightly horse-drawn carriage rides take you around the Landing and much of Downtown. 38.61073-90.200926 Soulard Market, 730 Carroll St. Although strangely named ("un soulard " means "a drunk" in French. ), the Soulard neighborhood, covering the waterfront for several miles south of the Arch, is the oldest in St. Louis. The Georgian (or should that be Louis XVI?) style houses surround a central farmer's market which supplies the city's residents, supermarkets, and restaurants with the freshest, and inexpensive, local produce. This is the oldest farmer's market west of the Mississippi, and is open year-round every weekend. There are a number of bars and restaurants in the neighborhood as well, and visitors can celebrate French heritage with the locals during Mardi Gras or on Bastille Day. 38.6559-90.303817 The Delmar Loop. Delmar Blvd. straddles the city limits and University City. This street was named in 2007 by the American Planning Association as one of the 10 Great Streets in America. This is the area known as The Loop to most locals, however, usage of the term outside of the St. Louis area is not as popular due to more famous Chicago loop. Rock and roll legend Chuck Berry performed every month at the historic Blueberry Hill restaurant until late 2014. Although most popular with the 20-something hipster crowd, something can be found for everyone. Boutique shopping, ethnic restaurants (including many Thai establishments), upscale dining, independent movie theatres, record stores, nightlife opportunities, a few music concert venues, and people watching are among the many things to do on the Loop. Many restaurants feature outdoor dining to take in the bustling street scene. 38.61599-90.216428 Lafayette Square and Park. A fashionable area with tree-lined streets, Victorian and Second Empire townhomes, and shopping and cafés surrounds the city's oldest park - chartered in 1836. In the warmer months, the park features small concerts, picnic locations, art fairs, and a team that recreates old-style baseball - but it is walkable all year round. Twice yearly are walking tours of the area that will take you inside some of the more remarkable Victorian mansions. 38.60288-90.242669 South Grand and Tower Grove Park. By day, visitors enjoy the numerous boutiques and coffeehouses of South Grand Ave., and the shaded walking paths and recreational amenities of Tower Grove Park, including bike paths, playgrounds, a wading pool, several restored Victorian pavilions, and a Farmer's Market (Saturdays, May-Oct.). The park is a frequent home to festivals, including the pan-ethnic Festival of Nations (August) and PrideFest (June). By night, they turn to the numerous bars and restaurants on South Grand: a wide variety of food and drink options, along with one of the best people-watching scenes within the city limits. 38.6392-90.2389710 The Moolah Theatre and Lounge, 3701 Lindell Blvd (in Midtown/Grand Center), ☎ +1 314 446-4500. This refurbished former Masonic Temple now boasts a one-screen movie theatre. The single screen is essentially a giant living room that forgoes traditional theatre-seating; instead, it features leather couches, club chairs, and coffee tables. The Moolah also has two bars, ample lounge seating, and a bowling alley in the basement. A very cool place for a night out! Fourth of July Fireworks Celebration. The entire day is a major event in St. Louis under the Arch with concerts and festivities. Every year a major musical talent headlines the event; acts such as Cyndi Lauper, the Goo Goo Dolls, the Black Eyed Peas, and the Beach Boys have performed in the past. A dazzling fireworks spectacle caps off the night while tens of thousands of St. Louisans watch under the Arch lawn. This event kicks off a weekly concert series called "Live on the Levee", also taking place on the Arch grounds, and features a big-name musical act, food vendors, and games. The Veiled Prophet Parade is a St. Louis tradition for over 130 years, and is essentially the main parade with floats on the Independence Day holiday, starting at Washington Avenue and ending at Union Station. The Greater St. Louis Renaissance Faire. Come, travel back in time as you step into the beautifully wooded, 16th century village, we call Petit Lyon! Immerse yourself in the costumes and mannerisms of the era. Thrill to the exploits of Jousting Knights on thundering steeds. Roam the village shops for unique crafts and goods as our artisans demonstrate period skills. Delight in comedy, music and feats of derring do. Feast on delicious food and drink while strolling minstrels entertain. Interact with the colorful villagers, nobles, peasants and personalities of ages past. 38.62275-90.1835711 Riverboat Cruises. Take a cruise down the Mississippi River on the Tom Sawyer or Becky Thatcher riverboats. The boats have paddle-wheels (for display only) and a narrator with guide you around the industrial buildings on the Mississippi waterfront. They also offer cruises with dinner and live music at certain times and also a day trip to historic Kimmswick, Missouri. $20, $3 discount if purchased with a ticket to the top of the arch. St. Louis' two major-league sports teams (the Cardinals and the Blues) play in downtown stadiums just a few blocks apart. Other St. Louis teams play in the suburbs, like St. Louis FC (soccer) in Fenton. 38.6268-90.2025212 St. Louis Blues Hockey (NHL), Enterprise Center, 1401 Clark Ave. The Blues play in the Central Division of the Western Conference. 38.62254-90.1922713 St. Louis Cardinals Baseball (MLB), Busch Stadium, 420 S 8th St. Ballpark tours $10 adults, $8 seniors/military, $6 children. St. Louis' Major League Baseball team (and the 2011 World Series champions) has won 11 World Series titles, the most of any National League team, and second only to the New York Yankees. The Cardinals play in the Central Division of the National League. Behind-the-scenes tours of the ballpark are available daily all year (except for days with an afternoon home game) at 11AM and 12:30PM. 38.63254-90.2279414 Saint Louis Billikens, Chaifetz Arena, 3330 Laclede Ave, ☎ +1 314 977-4SLU (758), e-mail: tickets@slu.edu. Sports teams of Saint Louis University, competing in NCAA Division I in the Atlantic 10 Conference. With no football team, SLU's main sport is men's basketball, in which it often makes the NCAA tournament. The Billikens also have a rich tradition in men's soccer. Missouri Valley Conference Basketball Tournament (Arch Madness), Enterprise Center, 1401 Clark Ave, toll-free: +1-800-745-3000. Thursday–Sunday; ending 1st or 2nd Sunday in March. The nation's second-oldest athletic conference, the MVC, has all conference members' men's basketball teams square off in a 4-day tournament. The winner automatically qualifies for the NCAA Men's Tournament ("March Madness"). Single-game ticket from $23, all-games ticket from $115. 38.638611-90.23166715 Fabulous Fox Theater. Built in 1929 and restored to its glory, this rare gem seats 4,500. A performance at the Fabulous Fox Theater is a "must see." Only two of this design exist, the Detroit Fox Theater built in 1928 has also been restored and seats 5,000. Probably the two most ornate theaters ever built in the US, they were the first to have live sound. They were built for William Fox, the founder of Fox Film Corporation, the forerunner of Twentieth Century-Fox studios. These two original Fox Theaters are still among the largest in the US in terms of total seats and the size of the stage. 38.63854-90.2311116 Jazz At the Bistro, 3536 Washington Avenue. No visit to the Gateway City is complete without experiencing its rich jazz and blues heritage. 38.64001-90.2799617 The Muny. America's oldest and largest outdoor musical theater. A popular summer attraction show casing a variety of musicals throughout June, July and August. Tickets range from $6 to $50 or so, but the top several rows are always free. Come early (and bring binoculars) to the top entrance if you want to see a show for free. 38.59052-90.2191218 Off Broadway, 3509 Lemp Avenue. Boasting excellent acoustics, this comfy concert venue usually has blues, bluegrass, roots, and folk touring acts along with the occasional indie-rock and country performers. 38.65559-90.2979519 The Pageant. A venue for concerts and national touring acts, the Pageant usually has an extensive schedule of events ranging from rock, pop, soul and comedy. 38.62755-90.2020620 The Peabody Opera House. Formerly known as the Kiel Opera House, restored to its former magnificence. 38.6402-90.230121 Powell Symphony Hall. A magnificent performance center, home to the St. Louis Symphony Orchestra. 38.63802-90.2906622 The Shakespeare Festival. Each year, the Shakespeare Festival St. Louis produces professional Shakespeare theater, outdoors in Forest Park, free and for a diverse audience. Free shows are usually put on in the late spring and early summer. An excellent way to spend a summer evening in St. Louis. In addition it provides education through schools and community outreach. 38.6397-90.233323 Sheldon Concert Hall. The Sheldon's perfect acoustics earn it the reputation as the "Carnegie Hall of St. Louis". It features the best in jazz, folk, and classical music, and joins with the Sheldon Art Galleries to promote both music and visual arts. Whitaker Music Festival. Wednesday evenings in summer enjoy music in the beautiful Missouri Botanical Garden. Admission is free (after 5PM), and you can pack your own picnic basket and cooler. Genre ranges from jazz to folk-rock to world music. Bring folding chairs or a blanket to spread on the lawn. In addition to these entries, there are a number of suburban shopping malls in St. Louis County. Delmar Loop. Funky, hip and great for people watching, the University City Loop is one of the best places in St. Louis to fulfill your "alternative" shopping needs. Downtown St. Louis. Revitalized Downtown St. Louis is now home to a number of local fashion-forward shops and several upscale furniture stores. For the latest in fashion trends in a non-mall environment, there is nothing like checking out the boutiques downtown St. Louis. Most are centered around Washington Avenue. There is also a six-story Macy's department store in the company's Midwestern headquarters on Olive St. The Hill. The city's Italian district, The Hill has a great selection of Italian restaurants, shops and businesses. Washington Avenue, 900 - 2000 Washington Avenue. Washington Avenue encompasses the Washington Avenue Historic District, which used to be the garment district in St. Louis. It is full of warehouses and beautiful brick buildings. The area is now filled with artists, clothiers, hatters, and many restaurants and bars. Cherokee Street. Cherokee Street includes a 12-block stretch of art galleries, antique stores, cafés, restaurants and bars. As you're gazing at a restaurant menu in St. Louis, you're likely to notice "Provel" listed as a topping choice for burgers or pizza, or as an ingredient in other dishes. It's not just a weird local abbreviation for provolone! Provel is actually a processed cheese blend of provolone, Swiss, and cheddar cheeses, and St. Louisans put it on everything. Well, maybe not everything, but anyplace you'd expect to find provolone, or Swiss, or even mozzarella, you're likely to instead see Provel. Provel cheese is, in fact, a key component of St. Louis-style pizza, which by default consists of a cracker-thin unleavened crust, with heavily oreganoed pizza sauce and plenty of Provel on top. St. Louis-style pizza — made with Provel cheese on a super thin crust. Maull's Barbecue Sauce [dead link] — a spicy, semi-sweet tomato-based sauce unusual for containing pepper pulp and anchovies; available in eight varieties. Red Hot Riplets — a somewhat-spicy variety of potato chips made by local firm Old Vienna with St. Louis-style barbecue sauce. Ted Drewes Frozen Custard. Every St. Louis resident has had Ted Drewes at some point in their life. They have two locations in St. Louis, including one on the original Route 66. Featuring dozens of toppings for its famous frozen custard, it's a wonderful treat in the warmer months. Federhofer's Bakery, 9005 Gravois St, ☎ +1 314 832-5116. [dead link] Lubeley's Bakery, 7815 Watson Rd, ☎ +1 314 961-7160. If you are a fan of Italian, head over to a neighborhood known as the Hill. Home of Yogi Berra, the Hill has more Italian restaurants than any other area in the city. Adriana's, ☎ +1 314 773-3833. Sicilian. Not open for dinner but can boast one of the best Italian veggie sandwiches out there. Lines are long but move quickly. Cunetto's House of Pasta, ☎ +1 314 781-1135. Favazzas, ☎ +1 314 772-4454. Zia's Restaurant, ☎ +1 314 776-0020. One of the most popular restaurants on The Hill, Zia's pastas stand out in St. Louis. Rigazzi's Restaurant, 4945 Daggett Ave, ☎ +1 314 772-4900. High-quality Italian food, with lots of old-country atmosphere. Wait can be long, but food is good. Bar Italia. Italian. Delightful venue for parties, drinking, picking up lovely ladies and happytimes. Refreshingly, ID's are rarely checked, although this tends to be a bit of a secret, so the crowd is actually happily devoid of drunken teenyboppers. Coffee Cartel, 2 Maryland Plz, ☎ +1 314 454-0000. 24 hour coffee shop with free wi-fi. Dressel's, 419 N. Euclid Ave, ☎ +1 314 361-1060. Possibly St. Louis's only Welsh pub, Dressel's features wood panel walls, original artwork from floor to ceiling of literary and jazz legends, and a central bar that makes this quite a cozy establishment. Try the homemade pretzel, anything with their beer and cheese sauce, Ruben sandwich, or Welsh rarebit. Eau Bistro and Café, 232 North KingsHighway (in the historic Chase Park Plaza hotel), ☎ +1 314 454-9000. Trendy, avant-garde cuisine and a great wine list, this place is great for a date or night out before a movie or the nightlife options in the CWE. The Loop features award-winning dining, and has everything from sidewalk cafés to upscale restaurants. This is a great street to walk and find something that appeals to your palate. Many ethnic restaurants, including Lebanese and Thai, are on the Loop. Riddles Penultimate Café and Wine Bar, 6307 Delmar Blvd, ☎ +1 314 725-6985. A place to eat, drink, and listen to music on the Loop. A constantly changing menu features only food from local farmers and producers. Now under a different name. 38.6557-90.3052 Blueberry Hill, 6504 Delmar Blvd, ☎ +1 314 727-4444. A true landmark restaurant and bar, open till 3AM. Chuck Berry used to play here frequently. Absolutely filled with pop-culture memorabilia spanning decades, including lunchboxes, concert posters, toys, sports trading cards, and other Americana. This place is definitely not one to miss. Fitz's Rootbeer, 6605 Delmar Blvd. American Bar and Grill, Family friendly, watch the bottle factory go to work as you dine. The Melting Pot, 6683 Delmar Blvd, ☎ +1 314 725-4141. Fondue. Reservations are essentially required here. Pi, 6144 Delmar Blvd, ☎ +1 314 727-6633. The crowds don't lie - this is terrific pizza. Das Bevo (The Bevo Mill), ☎ +1 314 832-2251. 4749 Gravois. August Busch, of the Busch family and brewery, built this giant windmill as his private dining room in the early 1900s. Today it serves traditional German cuisine and amazing breakfast. Look for the giant windmill - you can't miss it if you're in South City. This restaurant closed abruptly in March 2009, reopening in early 2016 in time for Mother’s Day. Don’t miss the your chance to join the Beir-choir the First Thursday of each month. Eleven Eleven Mississippi, ☎ +1 314 241-9999. 1111 Mississippi. Consistently on critic's Best Of list (if not at the top), Eleven Eleven features an interesting fusion of American and Mediterranean/Tuscan cuisine and the city's finest wine selection. Exposed brick walls, an open kitchen, and a busy dining room has made this place a St. Louis favorite for the past several years. Lulu's Local Eatery, 3201 South Grand, ☎ +1 314 300-8215. M-Sa: 11:30AM-9PM; Su: Closed. A vegan restaurant with a great selection of draft beers. Merb's Candies, 4000 S Grand Blvd, ☎ +1 314 832-7117. Old-fashioned chocolates, candy, and other sweets. Try the 'bionic candy apple' and the delicious chocolate-dipped strawberries. Sidney Street Café, 2000 Sidney St, ☎ +1 314 771-5777. In a 100+ year old brick building, the inside features exposed brick and street lamps to be reminiscent of a New Orleans sidewalk café. The attentive wait staff always gives a verbal presentation of the entire menu, which has many tried-and-true favorites and seasonally changing newer items. A great place for a first date or anniversary. Chocolate Chocolate Chocolate Company, 6740 Chippewa St, ☎ +1 314 832-2639. Chocolate Chocolate Chocolate Company is an award-winning chocolatier founded in St. Louis, Missouri. The company was founded in 1981 after the founding chocolatier spend over a decade training with the finest chocolatiers in the world. They specialize in fresh, chocolate covered Strawberries, Premium Truffles, Gourmet Boxed Chocolates, holiday chocolates and chocolate molded novelties all made fresh daily. Hodak's, 2100 Gravois, ☎ +1 314 776-7292. Hodak's has been St. Louis' premier stop for fried chicken lovers since 1962! Hodak's has been featured on Rachael Ray's "$40 a Day" on the Food Network. If you like chicken and a lot of food for a small price, this is the place to go. (If you are meeting a group, you will not be seated until all members of your party arrive.) ~$5-10 per person. Blues City Deli, 2438 McNair, ☎ +1 314 773-8225. Some of the best Po-Boys from cities on the "Blues Highway", St. Louis, New Orleans, Memphis, and Chicago. Add in some Love with a little taste from Italy. Set it in a turn of the century store front in one of St. Louis' great historic neighborhoods (Benton Park. Drench your ears with some of the best Blues from the 1920s to the 50s. Olympia Kebob House & Taverna, 1543 McCausland Ave, ☎ +1 314 781-1299. Greek food. Broadway Oyster Bar, 736 S. Broadway, ☎ +1 314 621-8811. Cajun Creole cuisine with live jazz and blues. BB's Jazz, Blues and Soups, ☎ +1 314 436-5222. 700 South Broadway. Name says it all. Eat-Rite Diner, 622 Chouteau Ave, ☎ +1 314 621-9621. 24-hours. A 24-hour diner that looks like it is part of a 1940s movie set, complete with stools and pinball machines. Most sandwiches and other items cost less than $3. Burger: $2.20. Hannegan's Restaurant and Pub, 719 N. 2nd St, ☎ +1 314 241-8877. On Laclede's Landing, uniquely St. Louis in nature. Kemoll's, ☎ +1 314 421-0555. 1 Metropolitan Sq. Superb Italian cuisine in a stunning setting atop 1 Metropolitan Square. Mosaic, 1101 Lucas Ave, ☎ +1 314-621-6001. One of downtown's hotspots for food, festivities and fun, Mosaic is a fantastic modern fusion tapas-style restaurant featuring more than 40 wines by the glass. Rooster, 1104 Locust St, ☎ +1 314-241-8188. A small European-style café with great crepes, sandwiches, and salads. On the inexpensive side, this place is ideal for breakfast or lunch - or a weekend brunch. Schlafly Taproom, 2100 Locust St, ☎ +1 314 241-BEER (2337). Surprisingly good "European inspired pub food", and great microbrew beers on tap in a remodeled brick warehouse. Many tables have views of the beer being brewed in action, and as the building is quite old, you can feel the hum and vibrations of the brewery process through the floor. Tony's, 410 Market St, ☎ +1 314 231-7007. Opens 5PM. The only AAA rated five-diamond fine restaurant in the State of Missouri, this is considered by most to be the city's finest restaurant. Make reservations, look nice, and appreciate the fine cuisine and outstanding service. Top of the Riverfront, 200 South 4th St, ☎ +1 314 241-9500. at the Millennium Hotel, 28 stories up on top of the Millennium Hotel the restaurant revolves 360 degrees around while you eat. A wonderful view of the city and riverfront. Pappy's Smokehouse, 3106 Olive St, ☎ +1 314 535-4340. Slow smoked Memphis style BBQ. Long line will form during the lunch rush but it moves fast. The Fountain on Locust, 3037 Locust, ☎ +1 314 535-7800. Serves an extensive offering of decadent ice cream desserts. Everything is made in house except for the ice cream. Try the pineapple inside out cake in a cup. Or if you only have a small sweet tooth then the world's smallest sundae is just for you. They also have an abundance of adult only ice cream shakes and martinis. You should also give the signature Polish dill pickle soup a chance. Most tourists will be familiar with St. Louis' world famous Anheuser-Busch brewery, especially its signature variety Budweiser, or their best-seller Bud Light. However, unless you are accustomed to American style pilsners, it is unlikely you will find these and other Anheuser-Busch brands suit your palate. For those more familiar with European brews or who have been caught up in the domestic microbrewery explosion interested in sampling a local brewery's product, the Saint Louis Brewery's Schlafly microbrews are more likely to satisfy. Schlfaly is the largest microbrewery in St. Louis but not the only one. 4Hands, Civil Life, Urban Chestnut, Square One, Perennial Artisan Ales, and O'Fallon Brewery are just a few of the other breweries in town. They are definitely worth a look. If you would rather explore rather than choose one specific establishment, two areas in St. Louis are great for wandering from location to location: The Central West End (featuring Sub-Zero Vodka Bar, the Drunken Fish, Tom's Bar, the Loading Zone, Mandarin Lounge, and Bissinger's Chocolate Lounge all off Euclid Ave), and Downtown centered around Washington Ave (featuring Kyo, Home, Pepper Lounge, Lucas Park Grille, Plush, Nectar, and rue13). St. Louis's MetroLink system is great if you prefer not to drive, but much of the line will stop running by 1AM. The Big Bang, 807 N. Second St, ☎ +1 314 241-BANG (2264). Laclede's Landing. Two dueling piano players lead the crowd in a rock 'n' roll sing-along show. Blueberry Hill, 6504 Delmar Blvd (on the Delmar loop), ☎ +1 314 727-4444. Restaurant, darts, bar open till 3AM. Cicero's, 6691 Delmar Blvd, University City, ☎ +1 314 862-0009. Cicero's probably derives the bulk of its income from the pizza joint upstairs, which is fair, because the pizza is good. That said the main interest for the traveler is the well equipped bar and the venue downstairs, which hosts touring indie and rock bands. Halo Bar, 6161 Delmar. in the Music venue The Pagent. Hair of the Dog, 1212 Washington (Downtown). Washington's only dive bar; great atmosphere and cheap drink prices. Cheers-type environment, where everybody knows each other's name, and strangers are warmly welcomed. Service is a strong point, and this place is perhaps St. Louis' best watering hole. Pinup Bowl, 6191 Delmar. Bowling alley and martini lounge open till 3AM. Sub Zero Vodka Bar, 308 N. Euclid Av, ☎ +1 314 367-1200. in the Central West End. Venice Café, 1903 Pestalozzi St, ☎ +1 314 772-5994. South City area. A mosaic-covered bar with outside sitting features nightly music. St. Louis does have the host of usual Marriott, Hilton, Holiday Inn and similar chains. Check out chain websites for exact locations throughout the metropolitan region. One great thing about the city is an abundance of hotel rooms, convention and meeting space, and amenities for travelers. Since the city has a low cost of living, even for the Midwest, you might find even the most expensive hotels relatively affordable; rooms at even the Ritz-Carlton start in the mid $200s per night. In addition to the following listings, which are in St. Louis city, see St. Louis County for more listings. 38.63116-90.212481 Drury Pear Tree Inn (previously Hampton Inn), 2111 Market St, ☎ +1 314 241-3200. Near the Union Station. Swimming pool. 38.6279-90.21022 Drury Inn Union Station, 201 S 20th St, ☎ +1 314 231-3900. Indoor pool, restaurant. Restored historic hotel, near the magnificent Union Station. Moonrise Hotel, 6177 Delmar (The Loop). An affordable, luxury boutique right on the Delmar Loop. True to its name, the entire hotel, and every room, is lunar-themed. Check out the roof-top bar with great views of downtown. Close to Clayton, University City, Washington University and tourist attractions. Chase Park Plaza, 212-232 N KingsHighway Blvd, ☎ +1 314 633-3000. A historic luxury hotel in the heart of the Central West End, right across the street from Forest Park. The "place to see and be seen" in the roaring 20s, this place retains its original, elaborate yet graceful, ambiance after a $100-million renovation. Four Seasons Hotel, 999 N Second St, ☎ +1 314 881-5800. The Four Seasons' newest hotel, in Downtown St. Louis in the Lumiere Place casino and entertainment complex. The structure itself is an exciting and vibrant addition to the St. Louis skyline, and with being just steps from Laclede's Landing, there is plenty to do around this urban oasis. Hilton St. Louis at the Ballpark, ☎ +1 314 421-1776, fax: +1 314 331-9029. 1 S Broadway. Right next door to the St. Louis Cardinals' Busch stadium. Millennium Hotel St. Louis, 200 S 4th St, ☎ +1 314 241-9500, fax: +1 314 516-8149. The 28-story hotel offers 780 guestrooms and suites as well as 65,000 square feet of flexible event space in downtown St. Louis. It features the only revolving restaurant in St. Louis with 360 degree views of the city including the Gateway Arch. 38.63052-90.192293 Renaissance Grand Hotel, 800 Washington Ave, ☎ +1 314 621-9600. Luxury hotel, historic downtown flagship. The Roberts Mayfair - A Wyndham Historic Hotel, 806 Saint Charles St, ☎ +1 314 421-2500, fax: +1 314 421-0770. Luxury hotel. Join a guest list that includes Irving Berlin, Cary Grant and Harry Truman. Since 1925, American notables have made the Mayfair Hotel St Louis their St. Louis headquarters and home away from home. Once you experience the special blend of elegance and service, you'll know why. 38.6291-90.20774 Union Station Marriott, 1820 Market St, ☎ +1 314 421-6655. A hotel in the heart of downtown with 550 rooms inside the historic train station lined with trendy tourist shops. Access to the metro link makes this a convenient place to stay. St. Louis' designation as the Most Dangerous City in America should not deter the potential visitor. In reality St. Louis is just as safe as any other Midwestern city - that is to say, extremely safe in suburbs and wealthy neighborhoods, and quite dangerous in inner-city slums. The statistical discrepancy is because, unlike most cities, St Louis' municipal boundaries include mostly slums and very few suburb-like areas. The areas of the city proper that are most often visited by tourists, such as Clayton, Downtown, the Central West End, and Forest Park, have quite low crime rates. The northern suburb of Ferguson, Missouri gained widespread media attention in 2014 for riots against police brutality, but these are no longer ongoing. Some economically depressed North County suburbs like Wellston, Pagedale and parts of Normandy and Jennings, as well as many parts of North St. Louis city are unsafe. The post-war exodus to the suburbs has taken a huge economic toll on these areas, leaving many buildings abandoned, decaying, or demolished. East St. Louis, in Illinois, is also noted for its high crime rate (this is not true of Alton or Belleville, in Illinois to the north and south). When in the city, a general guideline (though politically incorrect and somewhat simplistic) is that areas north of Delmar Blvd are unsafe, and should be entirely avoided after dark. Most tourists, however, will have little reason to visit any of these places, so it should not present reason for much concern. Some Metrolink stations are in areas some may find questionable after dark as well. But most downtown areas around Busch Stadium, and Union Station, as well as the St. Louis University area and commuter lots near the airport, are generally safe and patrolled. St. Louis sits on a fault line, whose last big earthquake changed the course of the Mississippi River. Another earthquake still remains a possibility today—albeit a remote one, according to most scientists. St. Louis gets a lot of urban tornadoes, so make sure you understand tornado safety precautions. Germany (Honorary), 330 Wenneker Dr, ☎ +1 314 567-4601, fax: +1 314 567-1101, e-mail: lansing@ix.netcom.com. Italy (Honorary), One Metropolitan Sq, 211 N Broadway Ste 3000, ☎ +1 314 259-5931, fax: +1 314 259-5985, e-mail: jcola@sonnenschein.com. Ireland (Honorary), 1015 Locust St, Suite 710, ☎ +1 314 727-1000, fax: +1 314 727-2960. Netherlands (Honorary), ☎ +1 636 751-0984, e-mail: stlouis@nlconsulate.com. The Katy Trail State Bike Trail. The Katy Trail is a bike path built where a Kansas-Missouri-Texas railroad line formerly ran. It's over 200 miles long, and biking on a section (or the whole thing) and stopping on the small towns dotting the tree-lined trail is a worthwhile excursion. Great place for bikers, runners, and those who want to experience small town Missouri and the great outdoors. Lewis and Clark State Memorial Park (Camp Dubois) where the Missouri River joins the Mississippi River. On the Illinois side, about 15 miles from the Gateway Arch. Take I-70 North to Exit #248A McKinley Bridge, then Hwy 3 north towards Alton, exit at New Poag Rd. (Hwy 203) and turn left. This is the location that explorers Lewis and Clark stayed at to begin their journey to the Pacific in 1803-04. Short hiking trails, 82 campsites, 1930s lodge, popular for family picnics. Alton is a historic river town just across the Mississippi River from St. Louis. Enjoy wineries, winter eagle watching, 50 antique shops, 9 golf courses, historic sites, fine dining, and elegant bed and breakfast accommodations. For a scenic day trip, take the Great River Road north from Alton to Grafton, Illinois, stopping for antique shops and then on to lunch at the Père Marquette Lodge in Père Marquette State Park. This drive is especially beautiful in the fall months, but in the winter you can see a number of bald eagles roosting along the river bluffs. Jefferson City - Take a short trip to the state capital! This city travel guide to St. Louis has guide status. It has a variety of good, quality information including hotels, restaurants, attractions and travel details. Please contribute and help us make it a star! This travel guide page was last edited at 06:46, on 1 March 2019 by Wikivoyage user Mbrickn. Based on work by Wikivoyage users Traveler100, JakeOregon, Traveler100bot, ThunderingTyphoons!, Ground Zero, MSG17, Ypsilon, Mx. Granger and SelfieCity and others.